A sequel to the popular game featuring James Bond-like female secret service ace, Agent Jane Blonde Returns is a 5-reel 3-row video slot machine released in spring 2019 by Microgaming. 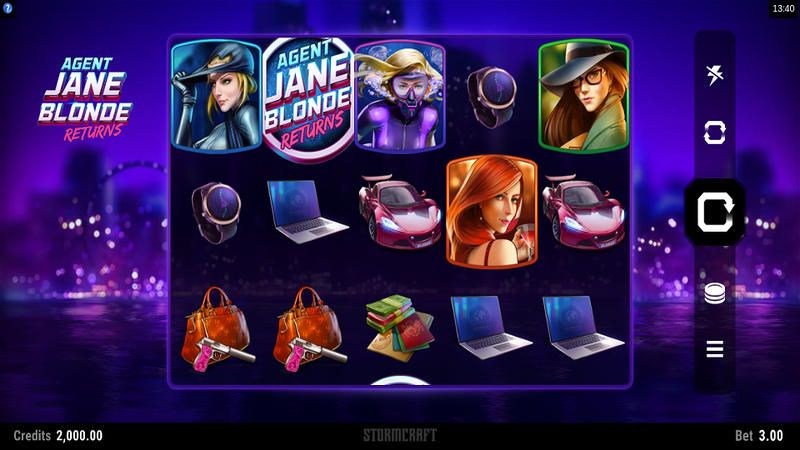 With indefinite Free Spins, Wilds and Sticky Wilds, this is an action-packed release of which you can learn more in the Agent Jane Blonde Returns slot review. We have no free play mode available yet, but take a look at the Agent Jane Blonde Returns screenshots instead. Or why not simply giving a try with one of the recommended casino sites above? The game takes you to the futuristic vision of London where FBI’s answer to the highly-rated British Secret Service agent and her associates work hard to unveil a series of bank robberies took by an international gang. Before the adventure starts, you will be politely asked do you want to play for fun or for real money, where the book rules remain intact regardless of your answer. This leads us to the game’s main premise: try to collect 3 or more symbols of the same kind placed on adjacent reels and collect the prize according to the paytable. Speaking of prizes, the Agent Jane Blonde Returns Free Play grants only demo credits, but it makes a fine choice for newbies to learn how to win and pay nothing in front. Also, they can set up a proper betting strategy later to be implemented when things become really hot. Our superhero works as the Wild and may turn into an Expanding Wild covering 1x2 or 1x3 field to help you form more winning combinations. In other situations, it will also improve a payline or replace a paying symbol. The only thing that has nothing in common with Wilds is the Agent Jane Blonde Returns Bonus icon that may trigger an extra rewarding feature should be collected in sufficient numbers. Speaking of symbols, you will find detective-related gadgets such as spy watch, fast cars, laptops, purse with a gun and forged documents as icons with a higher payout rating. Also, lucky winners will score a significant amount of cash when the gang members are lined up on an active payline. When at least 2 game logos appear on the reels 1 and 5, you will activate the Respin feature with Bonus icons turned into Sticky Wilds remaining their position throughout the Agent Jane Blonde Returns Free Spins mode. Another Wild landed on the reel grants an extra Respin, which means you can play at the casino’s expense for as long as the entire layout is fully-covered with Wilds. Finally, the last-mentioned is where you claim the Agent Jane Blonde Returns Big Win. 3. What is the RTP factor of Agent Jane Blonde Returns? The official RTP info is still to be disclosed by Microgaming. Soon after, we will update the Agent Jane Blonde Returns tutorial. The Agent Jane Blonde Returns recension showed we have a simple game where the focus is clearly moved to octane-packed action instead of mind-breaking bonus features. Players of all experience levels should find the tips collected here more than useful, as they will short any cut to the static jackpot prize.